In this definitive description of the body-centered therapy developed by Marion Rosen, the reader begins to understand how emotional and physical ailments can be addressed through the gentle touch of the Rosen practitioner. Rosen explains how the practitioner identifies tensions in the body that point to the source of a problem and how that awareness guides the healing process. 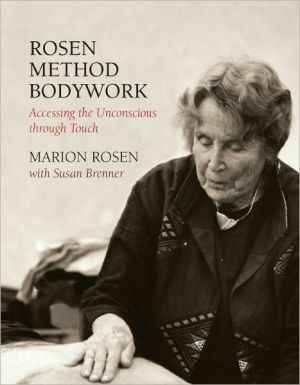 With the help of psychotherapist Susan Brenner, the director of Rosen Center East and one of Marion’s first students, she describes the origins of her method; how people reveal their emotions in body postures; barriers they set up to love, self-expression, and intimacy, and how Rosen work enables a client to move beyond these barriers. Treatments for asthma, migraine headaches, heart problems, weak immune systems, and psychosomatic illnesses are chronicled. Essays by doctors, psychologists, and Rosen practitioners describe how this method of touch, words, and acceptance guides their work, and complete this remarkable tribute to a visionary woman. Call the center for pick-up or use the button below to purchase online. $15.00, plus $3.00 for shipping within the U.S.